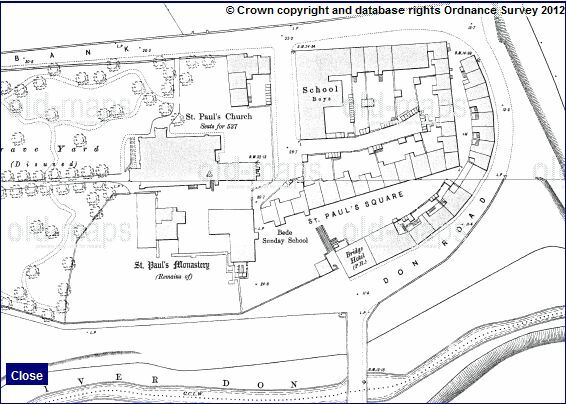 Unfortunately they were not local to Teesside, but I have been able to confirm this location as St Pauls in Jarrow with the help of Norman Dunn and the people who added to the comments. Doesn’t seem anywhere local. Features (a) a rather distinctive church spire, (b) a railway bridge made up from an iron and steel trough, and (c) a sunken lane under the railway, could be about anywhere. Probably an insuperable problem. May be worth asking the Gazette or Echo if they want to reproduce it, given it was found at a Saltburn auction. Mike Morgan at the Gazette or Chris Lloyd at the Echo (both have an interest in history) might be helpful. Well, the church has a ‘duble nave’ and is extended beyond the tower. It can’t be that hard to find. the church is Norman, evidently double knave churches are common in Wales. The bridge is certainly a railway over bridge but is that a sunken path or a watercourse with a tidal effect–in the second plate I think I can make out water and there is an even dark band between what appears to be water and the snow covered ground.Not really much help but who knows! I can’t think of any Norman chuches in Teesside, can anyone else? I think the ‘watercourse’ might be seen as such due to the shading of a negative plate. The first picture looks like it was taken in a ‘sunken lane’ (rather than a watercourse) going under the bridge, but, of course, I could be wrong. it’s all good fun speculating though! I tend to think if it was only a lane the railway builders would have simply extended the embankment or built a much smaller and cheaper bridge.I do get a sense that the scene is familiar but then most pictures of the time tend to look similar.Chris, have you tried any printing off or enlarging? some of the old glass plates had asurprising amount of detail. I contacted a local expert in Jarrow who has a huge collection and he’s confirmed its St Pauls. Glad you’ve got it confirmed – it was the right-hand side of the 2nd slide that confused me! So was it a stream or a sunken road ? I think it also means that the earlier photos are of a regional family – probably from that area. That matches spot on, cheers. Good bit of detective work!–ah the power of the internet.OnGoogle earth you can just about figure out where the picture was taken from but it’s all a bit different now.Maybe someone from up there would like to try and recreate the picture as it is now.